I handed a petition to the Mayor of Hounslow on behalf of signatories from the College Road, Grove Road, Avenue Road neighbourhood requesting parking controls at the 27.1.2015 Borough Council meeting. Other submissions recorded that night were two separate petitions from the Thornbury Road neighbourhood and another from Wyke Gardens estate, also requesting local parking controls. 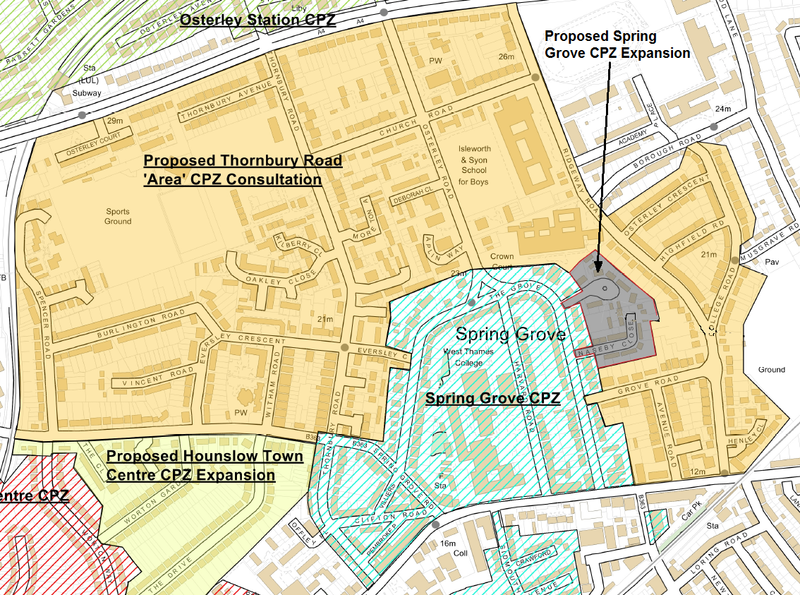 The petitions submission coincided with the reporting on a consultation for a controlled parking zone south of Spring Grove Road from The Drive to Gresham Road in Hounslow Central Ward. The Thornbury Road area petitions were raised at the Isleworth & Brentford Area Forum on 6.11.2014 where it was agreed that work should start in response to the Thornbury Road petitions. The three Osterley & Spring Grove Ward councillors met with Mr Sahota of the council’s Traffic Team later that month to discuss and agree a process and consultation timetable. Anticipating receipt of this petition, it was agreed that all petition areas be consulted at the same time. Stymied a little by Christmas and the Murphy electricity cable works in the neighbourhood, Traffic Team officers have prepared consultation material to go out this month to gauge interest and opinion on options for CPZs in the remaining neighbourhoods of Spring Grove. The official map (11Mb) of the proposed CPZ areas is available here. The consultation area is wider than (it includes roads west of Thornbury Road) those in the petitions mainly to gauge opinion in other roads where residents may feel there are similar or particular parking pressures. It is expected that the responses will help determine which neighbouring streets would be grouped in neighbourhood CPZs and not a whole one from College Road to Spencer Road. When the results of this consultation come through, traffic officers will draft schemes for the neighbourhoods favouring a local CPZ with preferences for boundaries, operation hours and potential design which would then need to be approved by councillors and formally advertised for comment. Not everyone agrees that Osterley & Spring Grove Ward is the most important part of Hounslow. The council’s traffic team is working on more than 30 schemes on the go across the borough, another two in this ward, Wyke Gardens Estate and as of 12.3.2015 Northumberland Gardens. Austere reduction of government grant to Hounslow has meant another £14.4m cuts for the year 2015/2016 regardless of growing local service demand for allsorts. When doing anything on the highway it’s not only the money but legal and democratic process too. 9. If no objections, install and implement including statutory “second notice”. Possibly operational by April 2016. Further updates will be reported on http://www.OsterleySpringGrove.com but please forward your e mail address to receive an early shout.